Rapid///CAST streamer SD/HD are based on x64 machine running Microsoft Windows with a hardware configuration designed for optimum performance in video acquisition, rendering and compression. A powerful mixer and switcher software VMIX allows realtime effects between different channels. On just a single screen, the user monitors all the inputs channel, the preview of the next channel and the live output. Rapid///CAST systems has multiple simultaneous outputs: preview operator monitor, hd-file on disk, live streaming delivery on the web, compressed stream on disk, LCD/LED panels, maxi-screen, video projectors which could be connected through VGA/HDMI/HD-SDI. Thanks to the high speed RAID configuration, VMIX could store full-hd video in full-resolution with any available codec for Microsoft Windows or hardware accelerated h.264 BlackMagic codec. A Full-HD multi-recorder plugin is available (as optional) to simultaneously record all inputs in separate files; the original input stream could besaved, in order to be used for post-production. With the same form factor of competitors, Rapid///CAST systems offer the same or better encoding quality with real time full-hd encoding and recording. 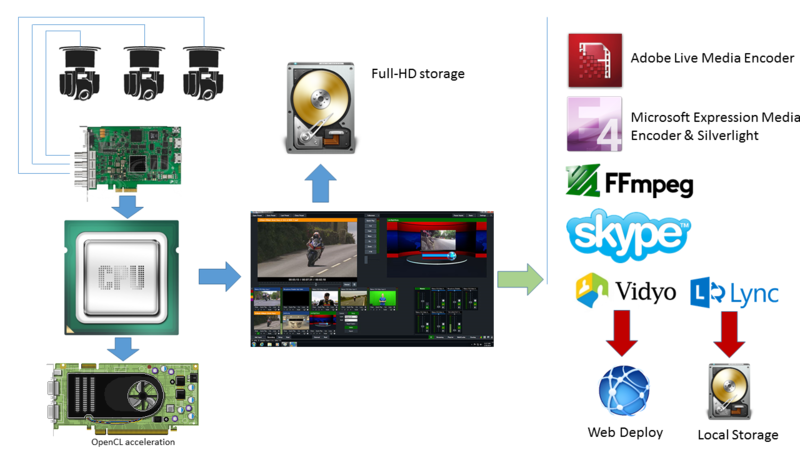 Adobe Media Live Encoder with h.264 and flash support, Windows Media Encoder, FFMPEG, Real Media Encoder could run at the same time on the same machine allowing the delivery of the same content to several platform covering the compatibility to all desktop and mobile devices. Another winning feature of our system is the possibility to use the mixed video inside the operating system of the machine we provide for video conferencing or chat applications, such as Skype, Vidyo, Microsoft Lync, Youtube Live Events and any other kind of conferencing software which supports standard video capture devices. This is achieved by the unique feature provided by vMix software to generate the output video as Windows standard capture device. All Rapid///CAST system are delivered with a pre-installed Rapid///CAST manager software that allows a complete automation of the streaming and recording at the boot of the system. The software could be configured to automatically open the vMix mixer software and all the encoder chain to directly connect to the streaming server as soon as the system starts up. Starting a live event becomes as easy as pressing the button to power on the computer. Rapid///CAST system could be integrated with Rapid///CAST automation system which automatically controls a pool of cameras connected to the encoder in an unattended streaming systems. 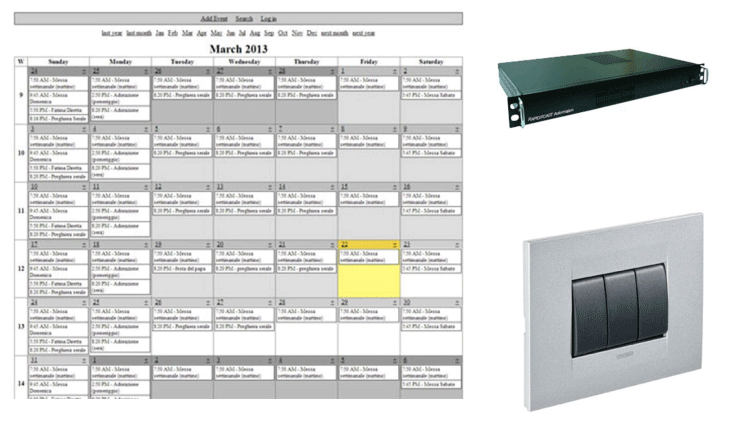 Also power on/off of the system could be remotely programmed on the base of a fully featured calendar. Don’t hesitate to contact us for any customization. We can customize our system with any pre-installed software. It is also possible to either buy the software licenses for you, or you can provide your licenses. Rapid///Cast Automation is a revolutionary system that takes the control of the cameras and the mixer, avoiding the need for a specialized operator and a director in unattended streaming systems. 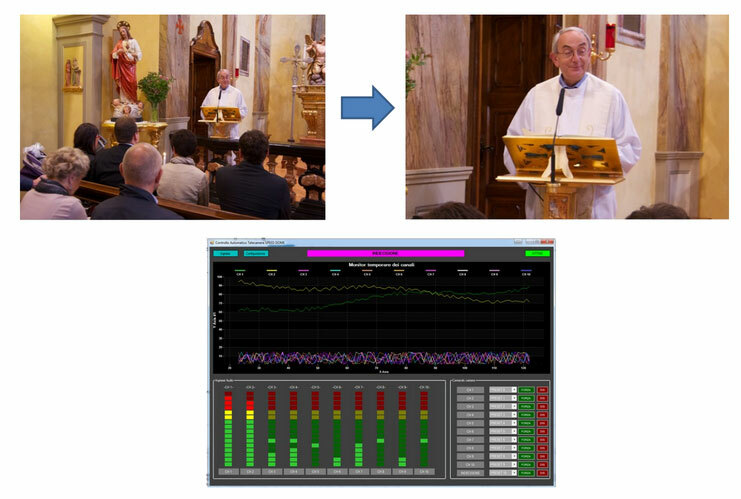 In a scenario like a conference room, a theater or a church, it analyzes the audio source coming from the microphones and controls PTZ cameras to focus on the speaker. Using at least two cameras, Rapid///Cast Automation can mix several video sources to avoid to show camera movement while streaming a live video. The synergy between the two cameras and the Rapid///CAST automation allows the implementation of a complete unattended dynamic streaming system. This is the ideal solution for conference rooms, churches and teathers. As soon as the speaker A begins talking, the PTZ camera (1) focuses on him and the mixer switches with a fade effect on the PTZ camera (1). When the speaker A stops talking, while speaker B begins, Rapid///CAST automation switches the video output on the fixed wide angle camera (2), allowing the movement of the PTZ camera(1) to focus on the speaker B. The use of two or more cameras allows to avoid to show camera movement in a live transmission. Integration of the Rapid///CAST Automation Camera Control Unit is extremely simple. It is installed as a pass-through unit before reaching the existing audio amplifier. No additional noise and no amplification is introduced to the microphone signal. The balanced (XLR) input is probed by using high quality electronics components. 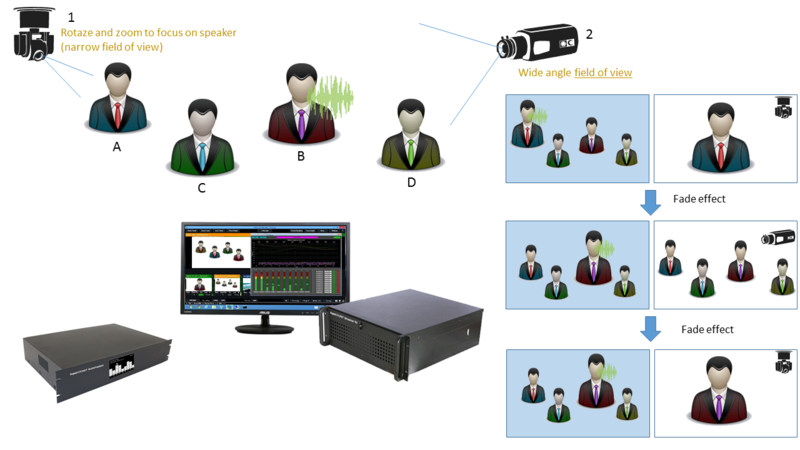 The camera control unit analyzes the audio provided from up to ten microphones that must be placed in front of speaking people. Each microphone has a fixed position and it is assigned to a camera preset of a PTZ camera or to a particular camera connected to the system. The audio signals coming from the ten microphones are analyzed in real-time by a software running on the mixer machine. When a microphone has an average signal magnitude well separated from the others microphones, the system drives one of the available camera (available means that the camera is not the streaming source in that particular time, in order to avoid the camera movement in the live transmission) to focus on that particular position and switches the video live to that camera (as soon as the camera positioning is completed). When the system switches from one position to an other, no blurred or moving frame are transmitted. This is due to the idea of avoiding to reposition live cameras, but only idle cameras. Complex algorithms running on both audio card and mixer pc side cooperate to avoid false commutation and isolate the speaker voice from environment noise. 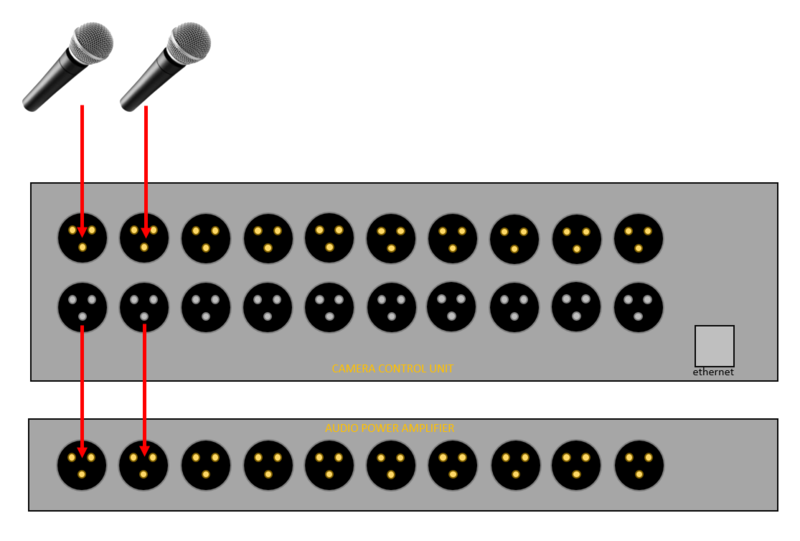 The connection between the audio card and the mixer computer is through a standard Ethernet connection, which allows the possibility to install the 10 channel audio card far from the streaming machine and use already existing network infrastructure, sharing the cable with other devices allowing no additional setup costs. The software interface shows in realtime the audio meters of all channels and plots a time vs dB history of all microphones. Settings windows allow to setup all working parameters like microphone vs PTZ preset or camera, thresholds, fade in/fade out speed and many others. The power control unit (integrated in the Rapid///CAST automation rack) is a full featured ethernet programmable timer that allows the remote power on/off the system, in an easy to use remote calendar way. It is possible to plan events by using an online calendar interface. It is possible to set-up the streaming start/stop time, the event title, the publishing location on the customer web site (a customer site integration is necessary ad must be quoted). It is possible to plan in advance one-shot events or plan repetitive live transmission (daily/weekly with the possibility to exclude particular days). It is possible to connect a Normally opened (NO) switch to manually power on the system. The button could be placed up to hundreds of meters far from the streaming server. The power control unit is included in the Camera Control Unit. If the Camera Control unit is installed far from the Server, it is necessary to buy a second power control unit to place in the same rack of the Streamer unit. In that case, a discount of 20% is applied on the second power control unit. 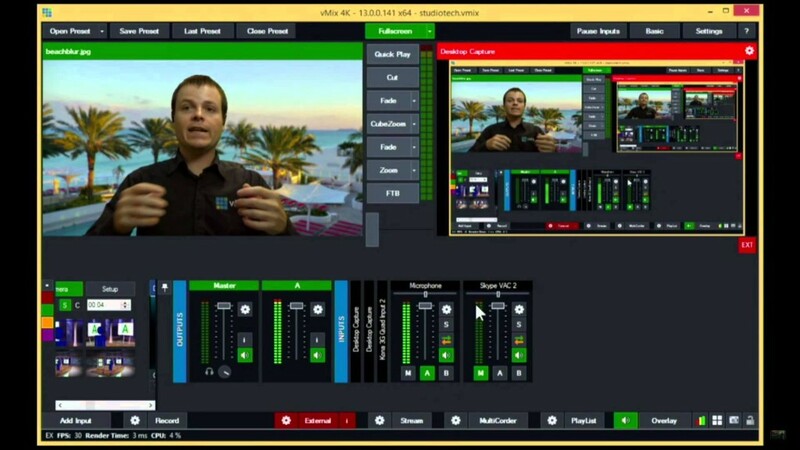 vMix is a video mixer that supports multiple sources at the same time. In ihis way, you can control several cameras, video playback from standard files (AVI, WMV, MPEG and QuickTime) or from DVD discs, and even PowerPoint presentations. It supports the handling of several input types, such as HDMI, HD-SDI, SDI, component, S-Video and composite. Additionally, you can mix audio files (MP3 and WAV) with the rest of the channels. Its main advantage is that the video mixing can be executed in real time, with almost no delay. It has a nice user interface with several preview panels in which the needed sources are queued. Furthermore, in case you need to play sequences of files, you are allowed to create a playlist. Then, by simply pushing a few buttons, you can change the screen contents and use transitions. It also allows the overlaying of several sources using the available templates. You will have an absolute control over the position of each overlaid source. Moreover, you will be able to add several effects and adjust picture parameters. vMix is an excellent mixer supporting high-definition video output and with a high performance level. Audio Capture support for Skype and other videoconferencing software is available under Windows 7. Titling capabilities Easily add and edit a Title or ScoreBoard from the many built in templates or build your own using any Graphics or Vector editing software. Audio Mixer Audio Mixer allows you to easily keep track of all audio sources and includes the ability to Mute, Follow (Auto Mixing) and Delay any source. Image Correction Colour Correct, Deinterlace, Sharpen, Zoom, Rotate, Pan and Crop any input in real time. All effects are processed in 4:4:4 32bit colour space for optimal video quality..
Multi view Combine multiple inputs together using the different "Multi View" presets or customise the position of each element with the available Zoom, Pan, Rotate and Crop controls. Overlay vMix includes 4 Overlay Channels in addition to the Multi View feature. Each overlay channel can have its own transition effect, position and border.